The Ellenbrook Lions Carols by Candlelight will be held on Saturday 1st December at the "Turkich Parade Oval" in Aveley, also known as the "Aveley Playing Fields" next to the Aveley Primary School. • Pre Carols entertainment from 5.30pm. • Food trucks will be on site which will include ice cream and coffee vans, etc. • The Ellenbrook Lions train will be providing free rides to the kiddies. • There will be Raffles with great prizes. • and, Father Xmas will be making an appearance. Lion John Pritchard in recognition of his 25 years as a Lion and being a charter member. Lion John Edgecombe in recognition of his 15 years as a Lion and being a charter member. Thank you to everyone who came along to the Outdoor Movie night in Ellenbrook last Saturday evening, 25th February. It was a warm night and the movie, Jurassic World, had the 700 plus crowd on the edge of their picnic blankets! 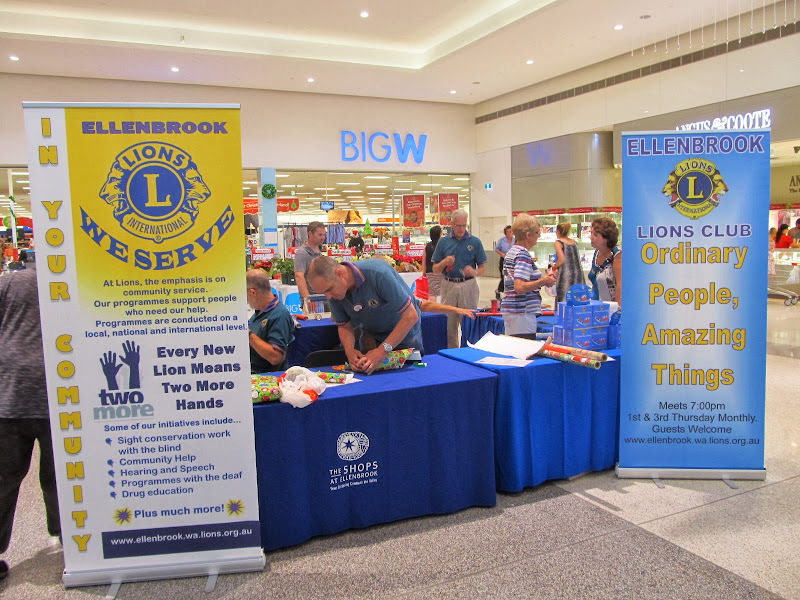 This event was arranged by Ellenbrook Central (our local shopping centre) and supported by Ellenbrook Lions, was a roaring success. The grassed area disappeared under a sea of rugs as families gathered under the stars. Once again our partnership with Ellenbrook Central has been a success and the over $900 raised in donations on the night adds to the $15,000 we have raised during the past four years in Xmas Cake selling and Gift Wrapping leading up to Xmas at the shopping centre. All funds raised are returned to the community in various forms. Today, 26 August 2016, a Seniors Expo was held at the Ellenbrook Community Hall which was attended by in excess of 20 not for profit Ellenbrook organisations with the ability to promote themselves to the general public. At last count, more than 250 members of the community attended. Pictured are our Ellenbrook Lions Treasurer, Norm Pearson and our Membership Chairman, Neil Rodgers manning our display plus the Mayor of the City of Swan, Lion Mick Wainwright. On 22nd July, the Ellenbrook Lions Club commenced presenting books to primary schools in Ellenbrook and surrounds. Today, two Elenbrook Lions picked up the Bus from the City of Swan which will be used for the transportation of the Lions Youth of the Year finalists from all around Australia during the next week. 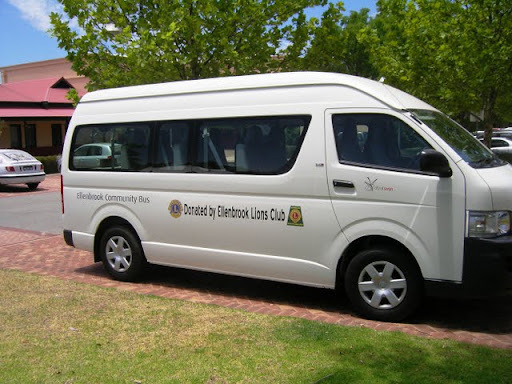 Interestingly, since it was donated by Lions Ellenbrook, in February 2010, it has travelled in excess of 80,000km serving the needs of the Ellenbrook Place community. Click the link below for the original story published in late 2009. Today,16 November, we broke our previous record of 125 sellers by an additional 30 and an estimated number of buyers of around 1,500 attended today - a great turnout! We are hoping to break it again at our next two on 15th February & 15th March 2015. Buyers and Sellers please help us do it!! Also, a huge thanks to the Ellenbrook Lions who answered our call to arms today. Today, 11th October 2014, was a special moment in the short history of Ellenbrook as a Dedication Service was held to celebrate the installation of a memorial at the "Ellenbrook Memorial Amphitheatre", (formerly known as the "Woodlake Amphiheatre"). After 3 years of hard work, sweat & tears, Allan Rodgers of the Ellenbrook RSL sub branch achieved his dream with the backing & support of his lovely wife, Elaine. Good on ya both! Pictured is Ellenbrook Lion John Edgecombe with the wreath which he laid on our clubs behalf today. The amphitheatre is a wonderful venue for such a memorial as a tribute to those who have given the 'supreme sacrifice'!! On Wednesday 10th of September Ellenbrook Primary School, with strong support from St Helena’s Catholic Primary School, and the whole school community set out to break the record for the most people dressed as trees. The youngest tree was 3 months old, and the oldest was 82. Even the Principal, Dr. Neil, was a tree for the day! Six Lions Club members, Lions Rad & Sue Dickerson, John Pritchard, Bob Schwind, Doreen Rees, & Ron Freestone provided independent oversight of the record breaking achievement, and their counters clicked in 766 people- A New World Record! The school principal, Dr Neil MacNeill, said that the school was grateful to the Ellenbrook Lions for their continued support. We are proud of your sporting achievements and for being a great example for our youth." Not only a women's Aussie Rules Football champ but now a Rugby Gold Medalist at the Youth Olympics!!! See how your support of LCIF delivers on the needs of people around the globe. One of the most important ways that Lions make a difference in their communities and the world is through Lions Clubs International Foundation (LCIF), the official charitable organisation of Lions Clubs International. With funding from LCIF, Lions carry out large-scale humanitarian projects in their community. Every dollar donated to the Foundation goes directly toward a grant, as administrative costs are paid by interest on investments. Lions’ support of the Foundation is critical, as donations from Lions provide the majority of LCIF’s revenue. Since LCIF began in 1968, it has awarded more than 10,268 grants totaling more than US$729 million. Together, Lions and LCIF are making a difference for millions of people. “We Serve” better together. 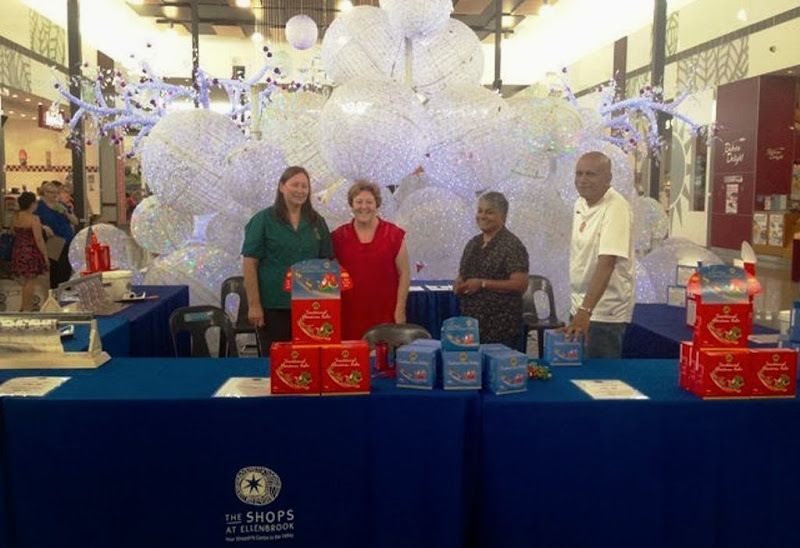 LCIF grants go toward Lions sight services, disaster relief, health initiatives and more. Support LCIF and make a difference. Danica’s Despair Turns to Delight! At the end of April, early May, the President of the Ellenbrook Lions Club, Ron Freestone, was contacted by Mike Kavanagh from the Family Assistance Foundation to see if the club could provide assistance to Danica Weeks, the wife of Paul, who was on the missing Maylasia Airlines flight MH370 in March. Before leaving on his first as a FIFO to Mongolia, Paul had started some renovations to their home in The Vines in Western Australia and Mike asked if Ellenbrook Lions could somehow organize the completion of what Paul had started for Danica and their two young boys. 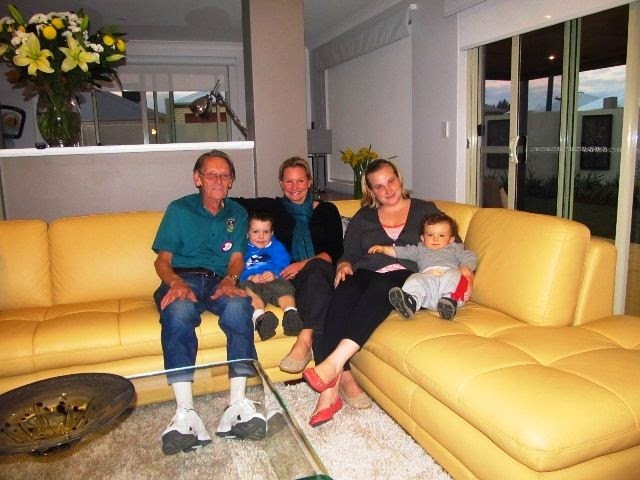 Ron immediately contacted Masters in Ellenbrook and sought their assistance. Before all of the above could be done, Channel 7 in Perth jumped on board on the 12th of June at the suggestion of Danica’s best friend and neighbour Terry-Ann du Plessis. The result was Danica was asked to leave the house before Monday, 16th June, and stay at The Vines Resort ‘free of charge’ until a complete home makeover by WA House Rules people, Carol & Russell, had been completed. Within two weeks, the ‘entire’ interior of the house was virtually ‘gutted’. On Sunday, 29th June, Danica and her two boys were picked up from The Vines Resort in a stretch limosine and returned home to find that the whole house had been totally renovated including all new furniture, appliances, fixtures & fittings, floor coverings, painting, a garden makeover and much, much more! Ron attended the above handover and was very appreciative of Danica’s recognition of Lions during the handover and the support of her over the journey so far. Thanks to the Ellenbrook Lions Club, my Dad is one happy individual. He was so happy by your generous donation and wants me to pass his thanks on. Words cannot describe how wonderful yesterday was when he got his electric chair and how thankful I am. They say a picture says a thousand words, well this one does. Once again from the bottom of my heart thank you. The House Ellenbrook Lions Helped to Build! 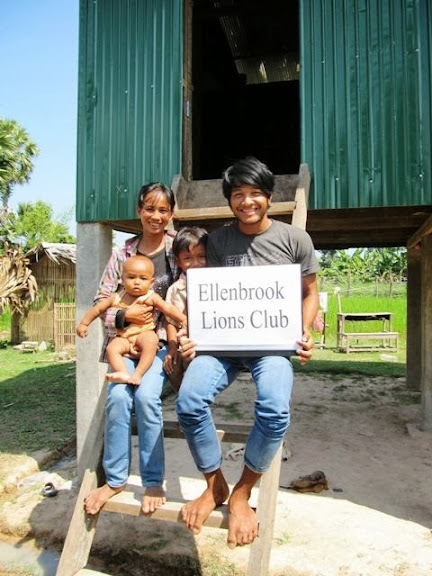 Almost 12 months ago, Ellenbrook Lions were approached by local residents, Keith & Julie Bleach to donate funds to build a house in Cambodia via the Tabitha Foundation. When we invited them to come along as guest speakers to one of our Social meetings back then, we could not believe that by donating $1,500 we could actually build an entire house but we decided to do it. Since then, Keith & Julie, went over to Cambodia in October and here is their report back to us. 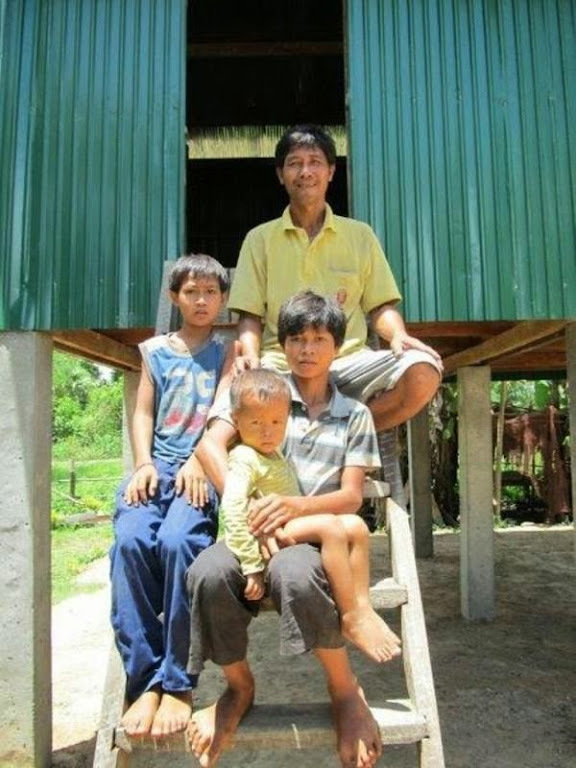 "Please find attached photos of the house the Ellenbrook Lions donated-with the extremely happy and grateful family from the Chak Chav village. The other photo is of the volunteer builders from Perth with all of the recipient families of the village. The team built 16 new homes for the villagers, housing 77 desperately poor, rural Cambodians in safe, weatherproof and vermin proof homes. While we were in Cambodia we also attended the grand opening of the Australia Samaki Primary School, for which we raised A$52000 to build.-- another 600 children are now attending school, who weren't able to previously. 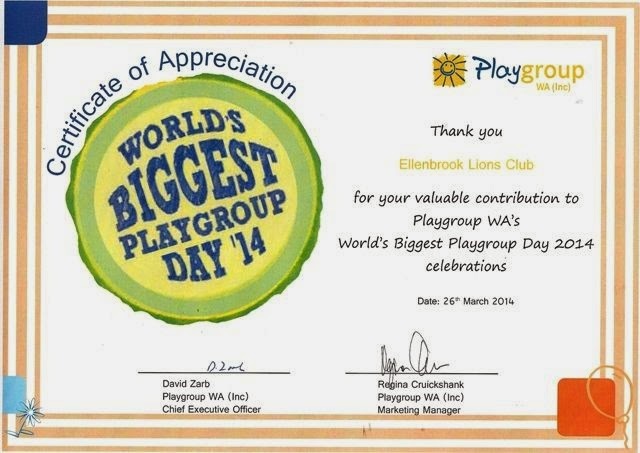 Once again we would like to sincerely thank the 'Ellenbrook Lions' for supporting the house building project." Ellenbrook Lions Responds to Another Little One! Jackson (pictured), from Aveley, in Perth, Western Australia, who turned 4 in January 2014, was diagnosed with Non-Hodgkin’s Lymphoma in June last year. He is currently receiving intensive chemo therapy treatment at PMH and is scheduled to do so at least once a week until September 2015. Ellenbrook Lions heard about his story and decided to pledge assistance to his family. Best wishes Jackson, hang in there and keep giving us those 'high fives'. Ellenbrook Lions Respond to Local Family! On hearing Sienna's story, (below) Ellenbrook Lions purchased a state of the art $1,000 Epilepsy Safe Bed which will monitor Sienna's convulsive seizures during the night from under her mattress. When these occur an alarm will be set off in her mother's room to awaken her but more importantly to help Yvonne to have a more unrestfull and un worrysome night's sleep. Pictured is Ellenbrook Lions Vice President, John Edgecombe, presenting the Safe Bed to Sienna and her mother, Yvonne, today, 22nd February. These type of donations cannot occur without the work of our Lions Club members in voluntarily raising funds via various means to return to the Community, but we need your help. Two More Hands WILL make a Difference! and also help us to help others in our community. "My name is Yvonne and I have a 4 (almost 5 year old daughter), Sienna, who has been diagnosed with a severe generalised epilepsy disorder named "Doose Syndrome". She has up to 200 different seizures a day, however, the main concern is the night time seizures where she stops breathing during a tonic-clonic seizure, has a status seizure requiring rescue meds and or sedation and is in a high percentage of falling victim to SUDEP (Sudden Unexplained Death in Epilepsy) due to the severity of her seizures through the night and also as they come in clusters." At Ellenbrook Lions Carols by Candlelight on the 8th of December, the students of the Academy presented two performances to the delight of the audience. In recognition of their outstanding contribution to the evening, the Club made a donation which will be used for a little party for them. 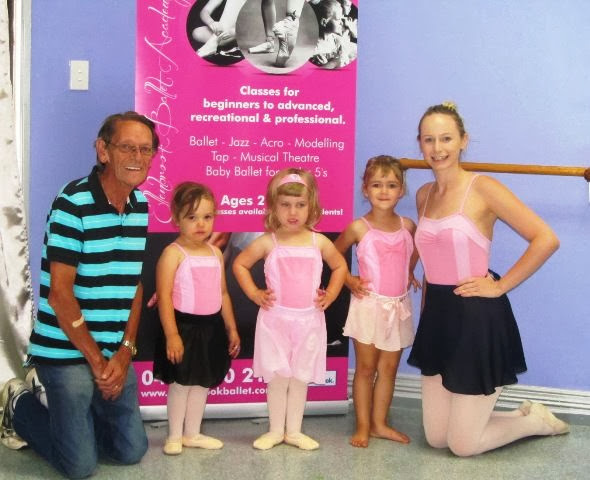 Pictured after the presentation, are the Principal of the Academy, Erin Heartly and Lion Ron Freestone with three of their youngest performers in training. Ellenbrook Lions - supporting the young people in our community. At our Social meeting on 6th February 2014, Ellenbrook Lions acknowledged Lion John Edgecombe's tremendous contribution and dedication in his nine years as our Lions Mints Committee Chairman by presenting him with a specially created engraved plaque. As a a matter of fact through the efforts of he and his team our Club was the highest sellers of Mints in Australia three years in a row - 2009, 2010, & 2011! - as well as runner up several times. This is an extract taken from the latest Newsletter of Frank Alban, MLA and a member of the Ellenbrook Lions Club. Last Saturday evening Lion Rob Longmire and I, Lion Ron Freestone were privileged to be the first ever to use all six of Ellenbrook Lions mini train carriages at an event and we did it at the above in downtown Ellenbrook, the fastest growing community in Western Australia. 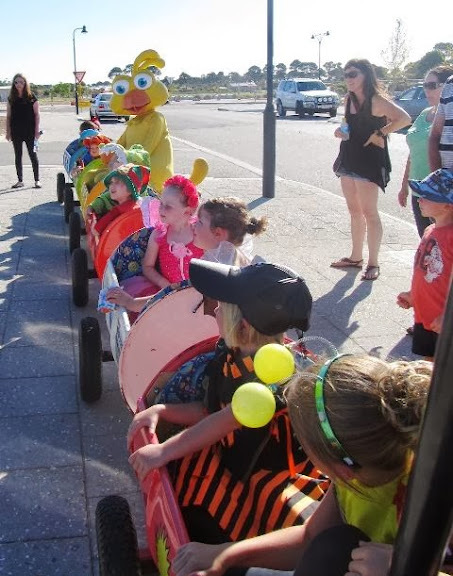 Pictured are our passengers getting ready to (board) the train for their journey, the passengers being the younger members of the Ellenbrook Community Youth Performance Group. It was a great experience for Rob and I, he driving, and I walking shot gun, with a couple of parents, and giving high fives to the young ones we knew as well as others we did not, many being very young but well and truly knowing what a fiver was! We passed the centre stage twice during the parade and got great public relations exposure for Ellenbrook Lions, and Lions in general, from Slim Jim, the compere. All up from whoa to go, Rob and I were there for about 3 or 4 hours but well worth the effort in our view given the PR we got! 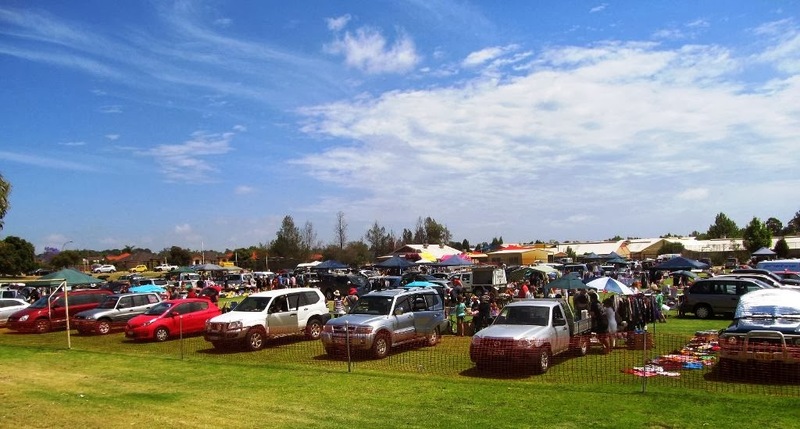 Today, 17th November, our Club had our most successful Swap Meet ever, as evidenced by the fact we had in excess of 120 Sellers and an estimated 3,000 plus buyers. In addition, we held a one day raffle which raised near enough to $460 thanks to Ellenbrook Lions Rob L & Mark H.
To top that off, we used our new PA System for the first time to announce the winners of the three prize winners and believe it or not most on the oval could hear it. As well,thanks to the presence of the Lions Western Australia Hearing Screening Bus, we look like gaining a new member! To our mind, the Bus is not out there to just screen peoples hearing but also by being at events like ours today - it most definitely raises Community awareness of our great organisation. Finally, thanks to all Ellenbrook Lions who volunteered today, who got up out of their comfy beds around about 4:45am this morning, as well as those who gave up family commitments to make today a resounding success - sleep well tonight, guys & girls! 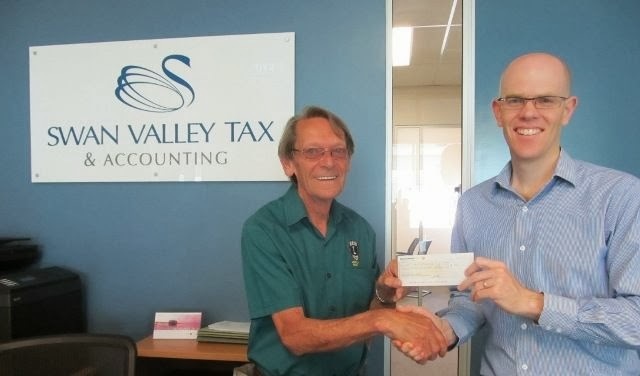 This year Swan Valley Tax & Accounting, in Ellenbrook, decided to create a program where they would give back to the Community by asking all customers having their Tax Returns completed by them up to 31st October to nominate their preferred of 3 not for profit organisations to receive $1.00. On the 11th hour of the 11th day of the 11th month in 1919, peace was declared to end World War 1. In other countries, it is known as Armistice Day but in Australia it is Remembrance Day. 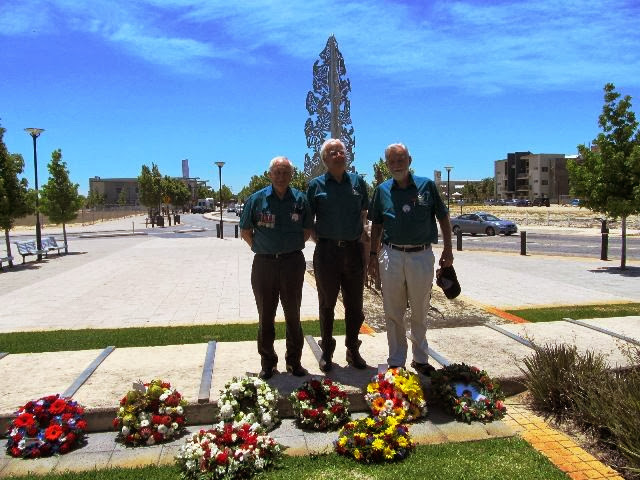 This year, Ellenbrook Lions were honoured to be requested by the Ellenbrook Returned Services League to lay a wreath at their 4th annual ceremony. Pictured are Lions John Edgecombe, Neil Rodgers and John Pritchard at the ceremony, the wreath on the right in the front row is our Clubs. It was a tough ride on day one with the majority of the 114km being in horrible weather with strong head winds and rain. Please pass on my thanks to those involved in my support from the Ellenbrook Lions again this year as you helped me to personally raise $5700. 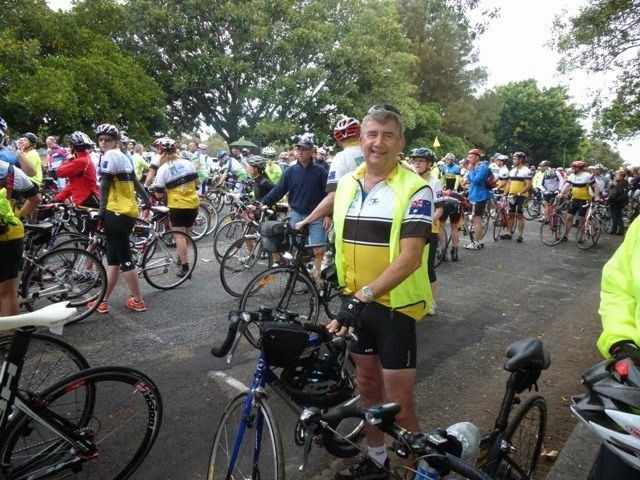 I have ridden in a team of four or five over the last two years, most of them family members, and in that two years we have managed to raise $40,292 between us. There is a rumour going around I may do it again next year!!! !